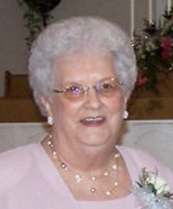 Mary Chambliss-Charlton, 88, of Crystal River, FL, died on Thursday, March 21, 2019, in Lecanto, FL. She was born on August 25, 1930, in Marston, Missouri, the daughter of Raymond and Alice Nelson. Mary was a life-long member of the First Church of God. She was a Sunday School teacher and was always willing to help when it where it was needed. She was preceded in death by her first husband of 40 years, Ed Martin Chambliss; second husband, J.B. Charlton; and her parents. Survivors include daughter, Shirley Gale Wymer and her husband Todd of Indianapolis, IN; son, Michael D. Chambliss of Crystal River, FL; sister, Betty Smith of New Madrid, MO; 6 grandchildren, Troy Wymer and his wife Kristen of Indianapolis, IN, Michael Chambliss and his wife Melissa of Crystal River, FL, Tracy Wymer and his wife Diane of Oak Park, CA, Jamie Graviett and her husband Douglas of Lecanto, FL, Kristen McCormick and her husband Robert of Hilliard, FL, and Heidi Wymer of Ponte Vedra, FL; as well as 12 great grandchildren, Ben, Reese, Lucy, Abby, Mason, Logan, Jordan, Lily, Noah, Anna, Sara, and Ansley. A Memorial Service will be held on Tuesday, March 26, 2019 at Ponder Funeral Home in Sikeston, Missouri. Mary’s final resting place will be with her husband Ed at Mound Park Cemetery, New Madrid, MO.